Image: South_agency/Getty Images. Design: Ashley Britton/SheKnows. During a sermon at the Ebenezer Baptist Church in Atlanta, Georgia, on Feb. 4, 1968, Dr. Martin Luther King Jr. told parishioners that after his death, he wanted to be remembered as someone who “tried to give his life serving others.” Somewhat prophetically, exactly two months after delivering those words, King was assassinated. His legacy is now nationally honored on the third Monday of every January, and in connection with the holiday, the Corporation for National & Community Service hosts the MLK Day of Service, allowing everyone the opportunity to follow in King’s footsteps through volunteerism. But beyond honoring King’s memory, volunteering your time or your hands or your voice can also benefit your own health. Of course, the primary motivation for doing service should be helping others, but as it turns out, it’s also good for your body and mind. “When we connect with a cause that we feel passionate about, we can help make the world a better place while reaping the benefits,” clinical psychologist and founder of the Paradigm Malibu Treatment Center Dr. Jeff Nalin tells SheKnows. Nalin notes that there are multiple health benefits to volunteering, including a decrease in blood pressure and the chances of developing a chronic disease, which in turn could potentially help you live longer. But the mental health benefits of volunteering are even greater. Nalin cites reductions in stress and depression, a boost in confidence and even making friends as mental health benefits. And the reaction isn’t just outward — there are actual changes that occur in your brain when you lend a hand. So, you want to volunteer but don’t know where to start? There’s an app for that. Chris Bolman, the CEO and founder of Brightest, a website and corresponding app that connect people to volunteer and activism opportunities in their area, knows firsthand about the benefits of taking purposeful action. Bolman founded Brightest after some frustrating experiences when searching for volunteer opportunities. 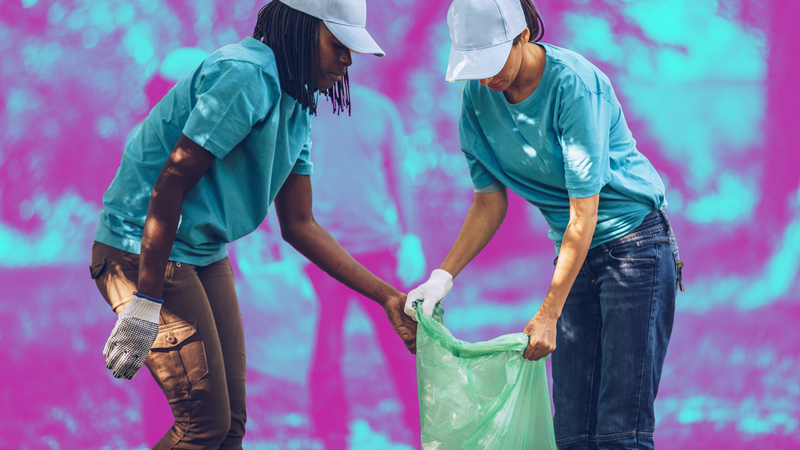 Brightest now boasts over 100,000 searchable opportunities across the country, including 30 different MLK Day of Service events from community cleanups in Baltimore and a day of activities and performances at the Milwaukee Public Library. “We personally feel good when we do good and help others — and that’s not selfish altruism, it’s a good thing and something to be proud of,” he tells SheKnows. And while services like Brightest are helping to increase the awareness of available volunteer opportunities, Bolman advocates finding the right altruistic activity for your own set of beliefs. “Whether you use Brightest or not, I think the most important thing is asking yourself what issue are you really passionate about or have personal connection to: is climate change important? Education? Social equality? Fighting poverty? Whatever it is, use your network (and the internet) to find what’s happening nearby and just keep trying new things,” he says. Donating your time to a cause that is meaningful to you can be extra rewarding on a personal level, but according to licensed therapist Christianne Kernes, it can also help to create a positive habit. “[Engaging in a cause that is important to you] increases the motivation to continue engaging in the cause. Simply put, you will stick to doing it,” she tells SheKnows. The Corporation for National & Community Service views the MLK Day of Service as a “day on, not a day off,” so if you’re looking for an opportunity to start making a difference, building a positive habit or just need a mental boost, both the MLK Day of Service site and Brightest offer search-by-location options. “Truly honoring the spirit of King should be a 365-day-a-year mission. I’m grateful that days like this get people volunteering in the community who might not otherwise, but [there are] so many ways to make small differences on your own terms, anywhere and anytime,” Bolman adds.